What KTVU’s sensationalistic bike coverage lacks in integrity, it compensates for in consistency. 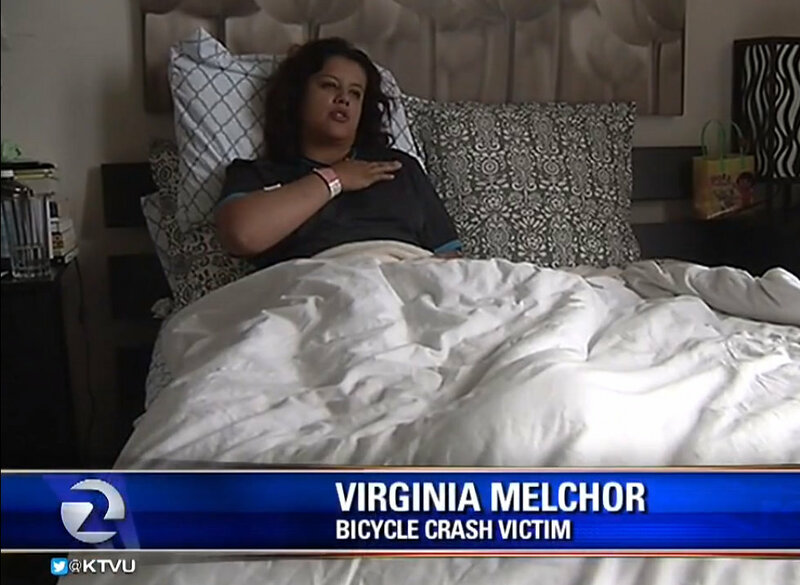 The Fox affiliate’s segment on the proposed “Bike Yield Law” yesterday kept the bar low in manufacturing controversy, featuring a bedside interview with a single mother recovering from injuries after being hit by a bicycle rider earlier that day. Melchor’s crash is as tragic and unacceptable as any. But it has nothing to do with the ordinance. That didn’t stop KTVU from exploiting it. KTVU didn’t bother to consult any experts on traffic law and street safety, but did feature SFPD Park Station Captain John Sanford and his binder full of complaints about bicyclists. But the point that continues to be missed by Sanford, KTVU, SFPD Chief Greg Suhr, and Mayor Ed Lee is that failure to yield to pedestrians would remain illegal. The ordinance would simply codify the idea that SFPD should not direct its enforcement resources toward the vast majority of people on bikes who slow down and yield at stop signs. They are not the ones injuring people like Virginia Melchor. Police data does show that drivers hit about three pedestrians a day, on average. And the number of people injured in traffic who need to be hospitalized for more than 24 hours is much higher than previously thought. Health Department researchers recently found that those cases occur every 17 hours, on average. Those stories don’t make the cut at KTVU. Instead the news team is all about harassing bicyclists without helmets and hyping scandals like bike-share, 27-cent parking meter fees, and the re-purposing of handfuls of parking spaces. Improving public safety on SF streets doesn’t rate. You can see why KTVU might be threatened by an ordinance like the Bike Yield Law. If San Francisco’s laws actually aligned with the safe, common-sense way that most people bike, there would be one less thing to sensationalize on the evening news. KTVU’s reporting about urban transportation issues is typically a joke and this segment is no different. KTVU used to have such an excellent news staff, but that was a decade ago. Like most news organizations it’s been hollowed out by budget cuts, and is only a shadow of what it once was. Sad. Given a notably large proportion of KTVU’s many commercials are advertisements for automobiles, and given the local Fox affiliate’s favored demographic is suburban motorists, the constant bias against bicyclists is par for the course. They literally get paid to gin up and amplify opposition to alternatives to driving cars. Virginia Melchor was exploited and doesn’t seem to even know it. Wait a second, I thought the news was that Sanford mended his ways with the bicycle community. Now he’s back to saying the same things as before. He shouldn’t be able to have it both ways. My 8-year old daughter and I rode through our bicycles through the wiggle at about 5 PM, passing the KTVU camera crew that had set up on the corner. We stop fully at each intersection and wait to confirm that no traffic is moving. It is quite clear that the footage was edited to only show segments during which bicyclists didn’t stop at the signs. TV news has to be sensational to get ratings – that’s how they can make those ads saying “we were there protecting you blah blah blah” etc. KGO tried to get me to comment on a video shot on Muni without actually showing me the video (rather, the producer “described” it to me) and I refused to take the bait. It was obvious they wanted to comment on the ongoing “muni fights” fad the media had a hard on for a few years ago. They don’t call me anymore lol! If we are expected to be able to look and yield to pedestrians at uncontrolled crosswalks, then why can’t we also similarly look and yield at stop signs? If a pedestrian can enter an intersection at walking speed without stopping, then why can’t a person on a bike also do so at approximately the same speed? I think the main issue lies in how bad many drivers (and people on bikes) are at yielding to pedestrians in general, and everywhere not just at stop signs. This is the result of the overuse and blind observance of stop signs and signals, as people get into the habit of just speeding from stop to stop. Signs are installed inappropriately everywhere as cheap traffic calming, when we should really be investing in things that physically slow down cars without reducing convenience for other road users, and which encourage people to actually look, pay attention, and yield when appropriate. Of course Melchor doesn’t feel exploited. I said she doesn’t seem to even know that she was. It is hard to feel exploited when you don’t know that you were. Pointness people will keep rejecting the “Bikers Yield Law” as unsafe. It’s possible to bring this kind of poor reporting up at their next FCC license renewal. Their license is up for renewal in 2022. (period of time covered by application). full calendar month prior to the month of expiration). Guys, let’s get in touch with Captain John Stanford and file a complaint every time you see a motorist cut you off, double park, play with their phone, or exceed the speed limit so that he doesn’t have to carry the burden of just one binder. A friend of mine has an aunt who was hit in Golden Gate Park. She’s not available for interviews, though, because it was a car that hit her, and killed her. This is such an American problem to have. In the rest of the world they’d just put up yield signs instead. I want protected bike lanes on SIDE STREET…not on major car thoroughfares. Seriously, why would anyone want to bike on Masonic, Van Ness, Market, Potrero, Chaves, Alemany??? Nightmare. But Americans are so selfish. No one can share space. Everyone has to have their own protected space, at the expense of others. Bikes make up 3% of commuters, yet on many major thoroughfares they are now given 33%-50% of the capacity, creating hundred of thousands of tons of greenhouse gases due to stopped cars. HOW IS THIS BETTER? Move bike lanes to side streets. Keep us separate from cars. I, too, would rather bicycle on side streets, away from the congestion, noise and exhaust of automobiles, however often times the very best streets to bike on (ie. those that follow the lay of the land and topographically offer the path of least resistance) are streets like Masonic, Van Ness (or Polk), Market, and Alemany. Side streets often have stop signs every block. Major thoroughfares have green waves, allowing motorists (and sometimes cyclists) to enjoy efficient and quick transportation). For the occasional cyclist, these issues may be unimportant. But for regular bicyclists/bike commuters and for those that wish to see more fellow citizens pedaling (for the sake of our environment and so much more), it makes sense to have good bicycling infrastructure built where it does the most good.